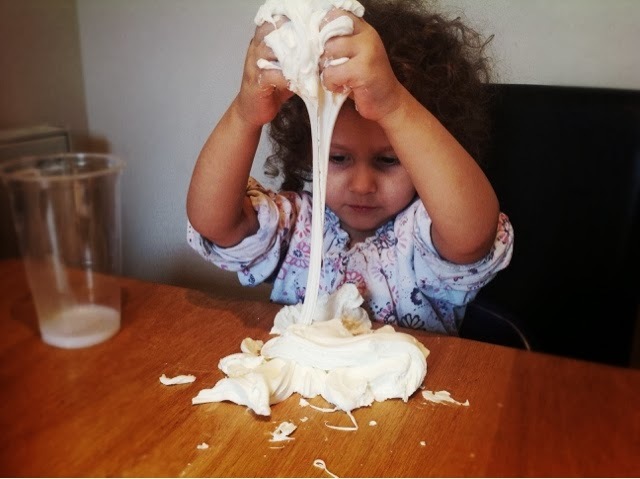 An Ordinary Life : Step by Step: how to make super stretchy play dough! Step by Step: how to make super stretchy play dough! I was inspired when I saw Kate's post for silky and stretchy playdough. As you can see in the photo, my 3 year old really enjoyed this activity. It is great for play but it also makes for a fun science experiment! I have read in other places that it is a soft silky dough therefore perfect for sensitive hands. This is not necessarily true. Lanolin (used in many sensitive skin products) can actually aggravate eczema and is in most conditioners. conditioner - the sort you put in your hair, I just bought some really cheap stuff, it cost me 89p! Corn flour (otherwise known as corn starch) which is also nice and cheap. Put 200g of corn flour into a bowl. Put 100g of conditioner in an old cup or a plastic one like in the photo above. Pour the conditioner into the corn flour. I let Harmonie, my 3 year old, do this bit and the nest two stages as well. Give it a good stir - we used a plastic spoon. Knead it together until it forms a nice dough. It's finished! Time to play! Hold it in the air and let the dough drip, it looks a bit like cream! Squish it together, roll it into a ball or any other shape. You will notice that the mixture is still dry even though it's a solid unlike my corn flour slime project that was wet to touch. Give them shells, buttons, lolly sticks, feathers or anything else you can find. We have made another Non-Newtonian liquid! Non-Newtonian because it doesn't follow Newton law's of liquid which stated individual liquids flow at consistent and predictable rates. It works this way because it is a type of colloid! So why is this a dry dough? It is because of the Propylene glycol. Propylene glycol is an emulsifier, but it is also a liquid substance that absorbs water. 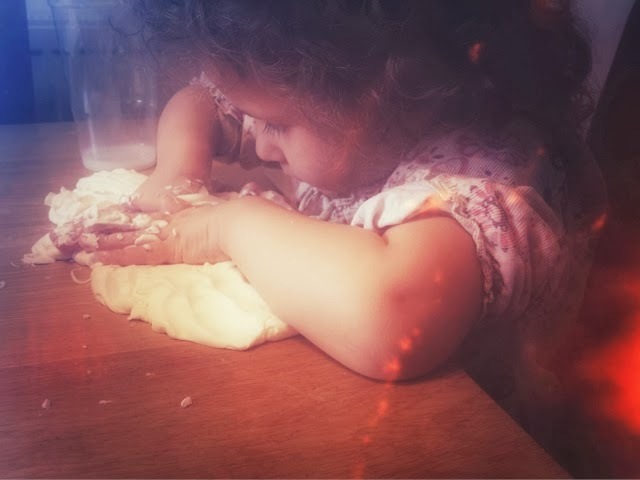 This does mean that it will completely dry out the dough in the end, if you want to continue play just knead in some more conditioner (you can read more about propylene glycol, at the end of this post). So, from my research today, I have discovered that adding this emulsifier, that is in the conditioner, makes it so we have a non sticky dough. Also the water in the conditioner creates a colloid with the corn flour and the emulsifier stops it from escaping from our stretchy play dough! So how is it so stretchy? To the best of my knowledge: the surfactants in the conditioner reduce the surface tension of the new compound we have formed. The corn flour may also be reacting with the glucose in the propylene Glycol which creates another surfactant. Also the fact that it is a colloid means that because it is a semi liquid - it flows like a liquid! So this is what gives us the very stretchy but dry, solid but runny dough! It gave my girls hours of fun playing with this, I hope you have fun with it too! A colloid - a colloid is a homogeneous (meaning it contains only one compound) non-crystalline substance that either consists of large molecules or ultramicroscopic particles of one substance dispersed through a second substance. Gels and emulsions are types of colloids. A surfactant reduces surface tension and the emulsion stabilises the mixture (stops the moisture from escaping). Scarily (I think) it is used by the chemical, food and pharmaceutical companies as an anti freeze! Food and drug companies see it as a safe additive!